My husband was sent by his office on a mission to Thailand for two months last year. 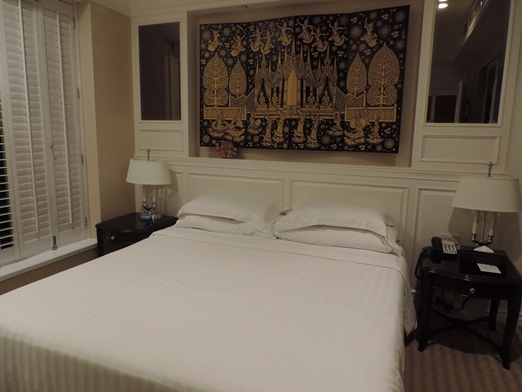 He stayed in a Grand Deluxe guest room at Grande Centre Point Ratchadamri in Bangkok, Thailand. It is a 5-star hotel that’s located a few minutes away from Siam Paragon Mall, Platinum Fashion Mall and MBK, among others. 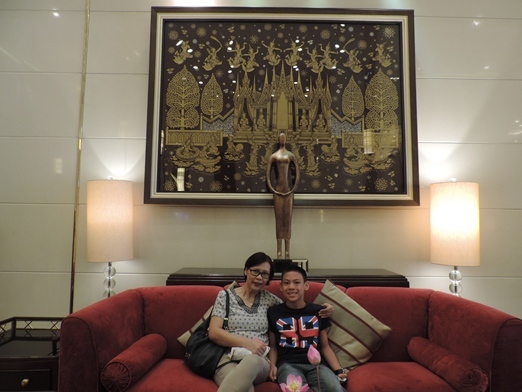 My son and I also got to stay there for a week after my son’s Hong Kong leadership training in October 2017. 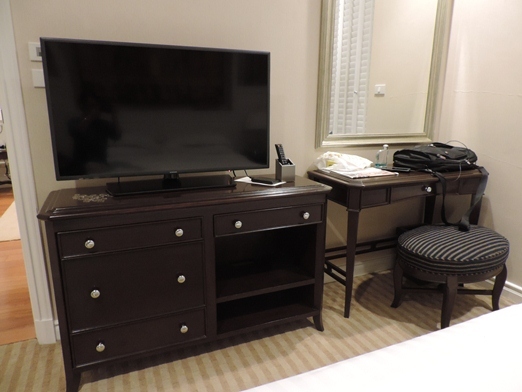 This Grand Deluxe Room practically has everything that a small family like ours need. It has its own kitchen, living room, bedroom and private bathroom with in-room safe, WiFi and air conditioning. There’s a refrigerator in the kitchen with free bottled water. 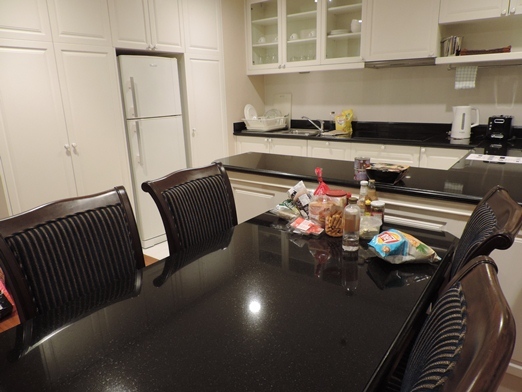 There’s also a minibar, microwave and coffee/tea maker, plus a washer/dryer under the kitchen countertop. 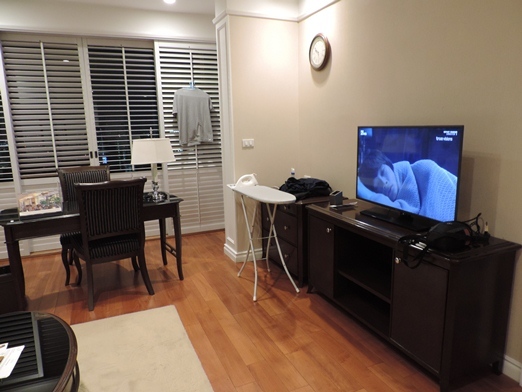 This gives guests the option of doing their own laundry, instead of availing laundry service. One of our favorite areas in this guest room is the living area, which has a huge and comfortable sofa and a 40-inch LCD TV with satellite TV channels. 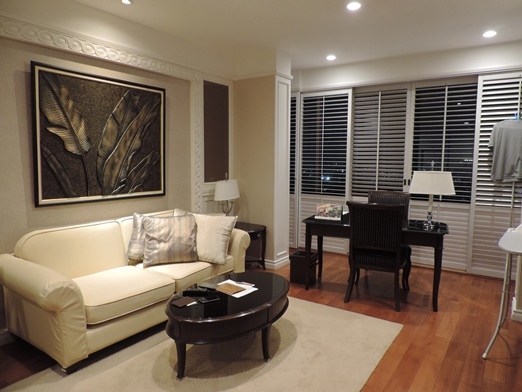 There’s also an executive desk at the far end of the living area to place your laptop and do office work. And as you can see, this guest room has an iron and ironing board, too. We have a king-sized bed in our bedroom that’s just good enough for the three of us, and there’s another TV, too, which was the same size as the one in the living area. 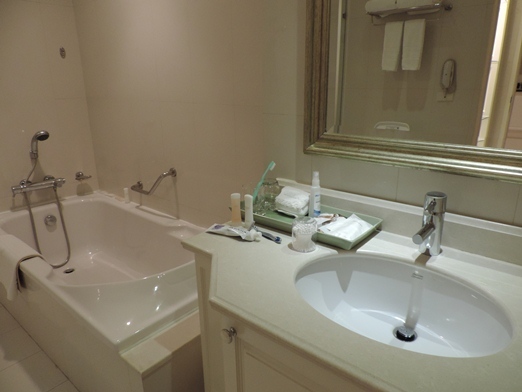 There’s a separate bathtub and shower in the bathroom, plus a hair dryer. 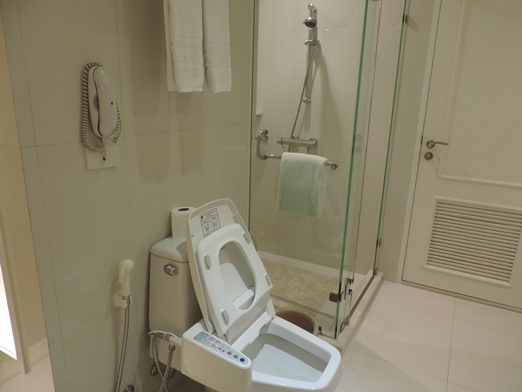 See how high-tech their toilet is? It has settings for water temperature and water pressure. 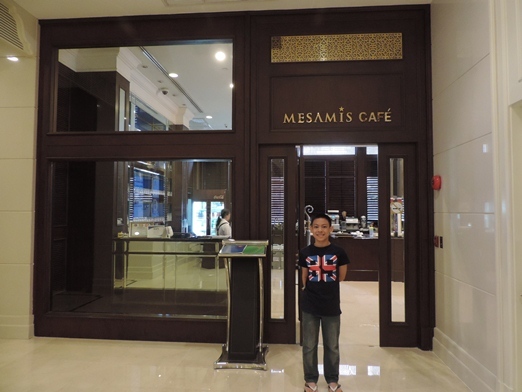 For 5 days, my son and I had buffet breakfast at Mesamis Café located at the hotel lobby after his Dad had gone to work. My son enjoyed their delicious sausages there! Because we were already comfortable where we were, my son and I didn’t really check out the other amenities of the hotel while his Dad was in the office. I actually regret not seeing their outdoor pool, sauna and Jacuzzi facilities and the spa. Our stay at the Grand Centre Point Ratchadamri was overall very pleasant, save for the time that we had to ask for instructions on how to use their washer/dryer. The staff had a difficult time communicating to us in English, so we just had to wait for hubby to fix the problem. We really hope we could go back to this hotel for another family vacation. This entry was posted in Grand Deluxe Guest Room, Grande Centre Point Ratchadamri, Hotel Review, Hotel Staycation, Mesamis Cafe, Thailand, Thailand Trip 2017. Bookmark the permalink. I have never been to Thailand but my husband has been in few places there. I’ll keep this hotel in mind just in case we travel there. I like that luxurious feel accommodation you had in Bangkok sis. It’s very pretty and complete with amenities.